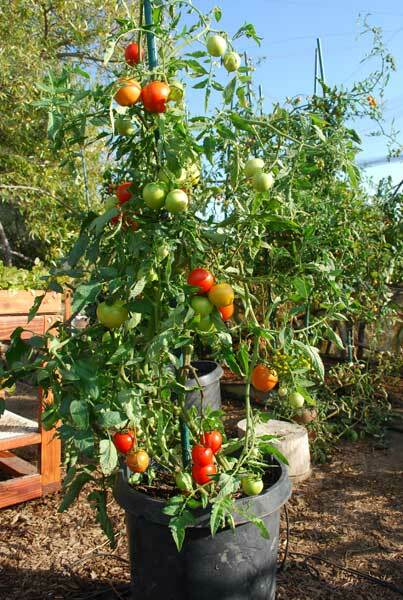 Growing tomatoes in containers is easy, as long as you give them a big enough pot, and keep them watered. 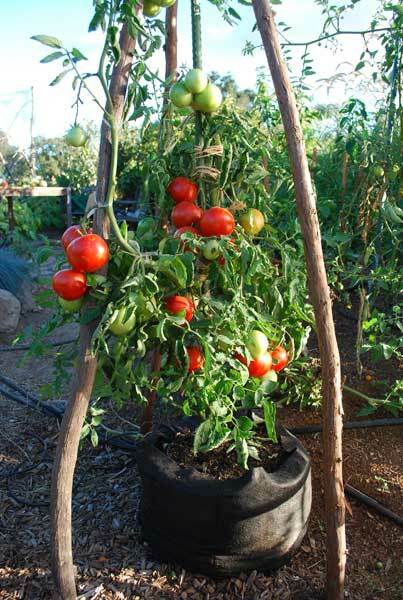 Tomatoes are heavy feeders with a big root system, and confining them in too small a pot will stunt the plants and depress their yield. 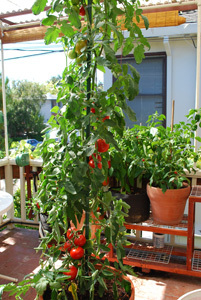 It will also mean watering 2 or 3 times a day on hot days, especially when the plants are large and setting fruit. Who has time for that? 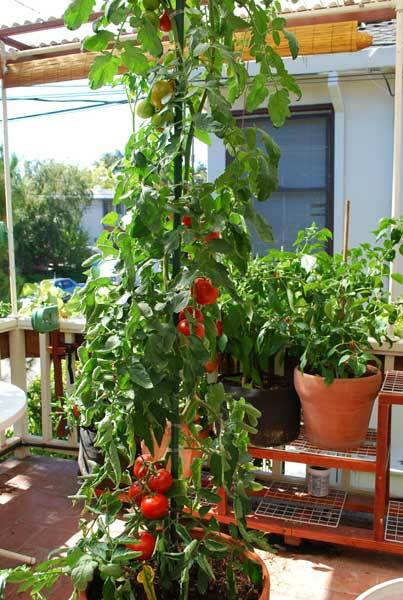 There are advantages and disadvantages to growing tomatoes in pots. The biggest advantage is, pots are mobile. If pests like deer, squirrels, or rats go after your tomatoes, you can move them to a safer, protected location. This allows you to keep the plants in the optimal temperature range for fruiting, 70-90°F (22-32°C). Tomatoes grown in the ground in southern gardens often stop fruiting in the hottest summer months, and don't start up again till it cools off in the fall. 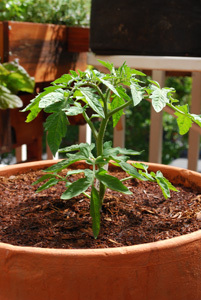 Pots also allow you to grow tomatoes on hardscapes like decks, terraces, and other impermeable surfaces. 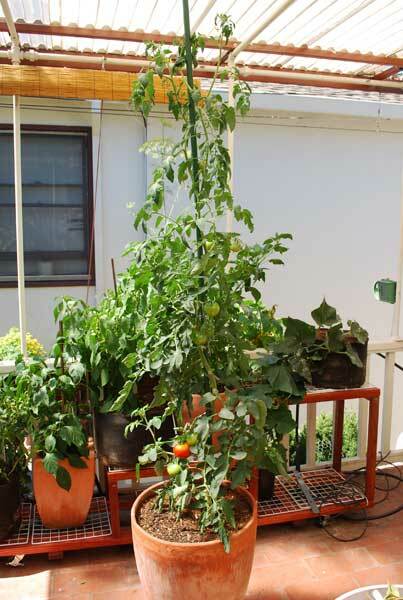 Apartment dwellers rarely have space to garden, but there's room for a few tomatoes in pots on the deck, terrace, or the edge of the carport. 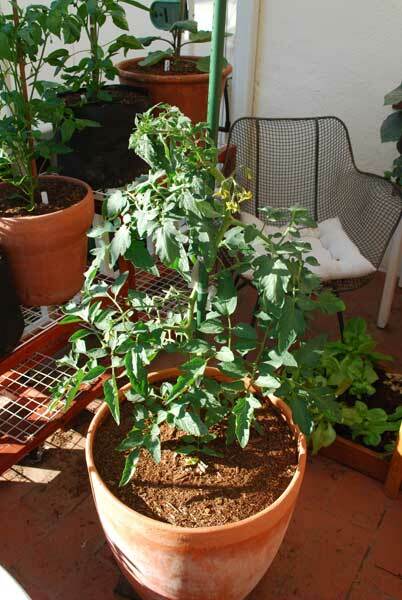 Growing tomatoes in containers also allows you to take full advantage of the best available microclimates. 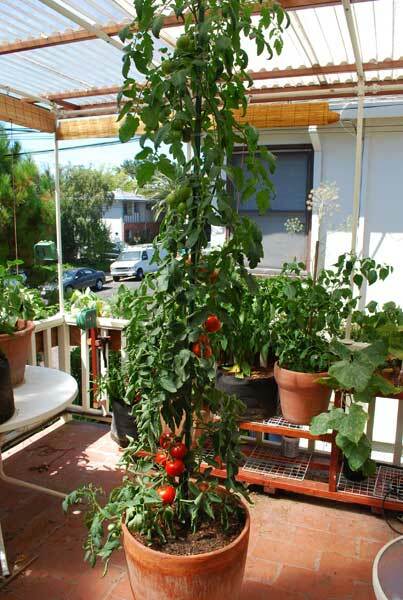 Many houses have decks on the south or west side, which is choice tomato growing real estate, especially in northern, alpine, or cool-summer gardens. 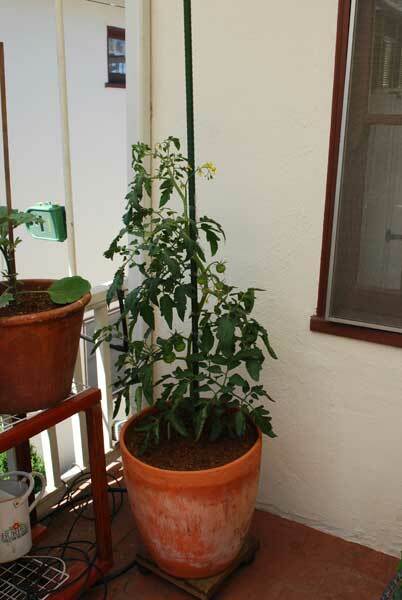 Container tomatoes can be placed against the south-facing wall, in the warmest microclimate available. The main disadvantage of container gardening is the need for frequent watering. Pots dry out quickly on hot decks, especially small pots. 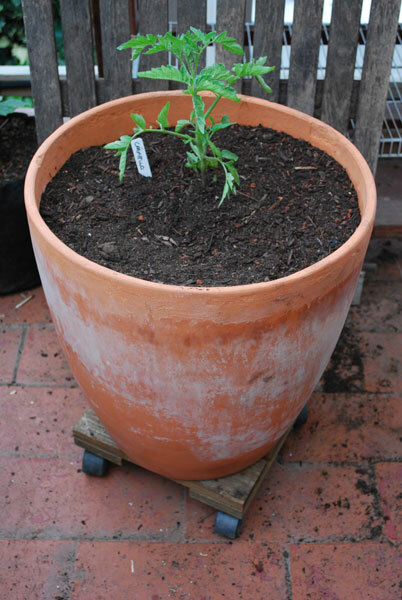 Mature container tomatoes need to be watered once a day, even when they're in large pots. In hot weather, they may need to be watered twice a day. 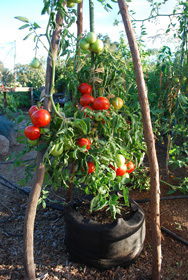 Tomatoes planted in the ground can usually go a few days between watering. 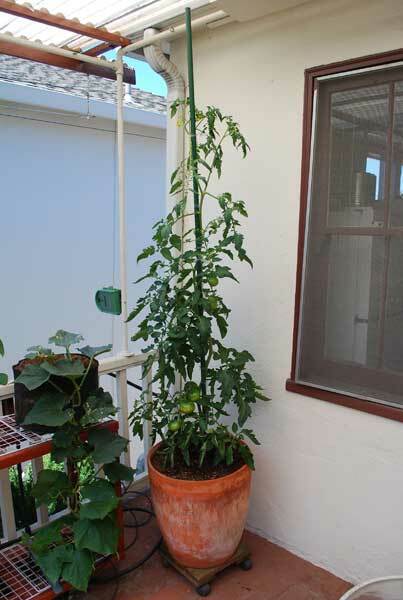 The biggest mistake people make when growing tomatoes in containers, is planting them in too small a pot. 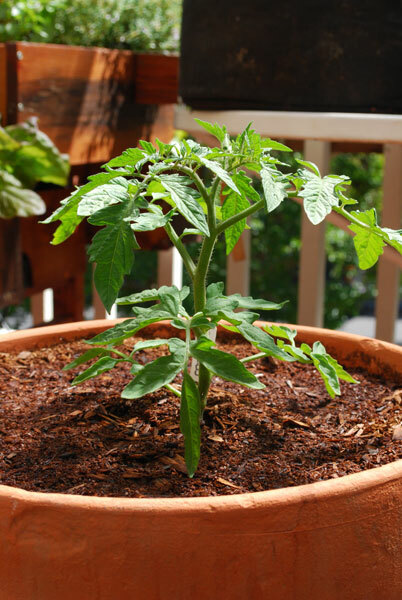 Tomato plants are large plants with deep roots, and if you keep them in small pots you get bonsai tomatoes, or dead plants. The minimum pot size for growing tomatoes is 5 gallons (27 cm). You need the large pot–and large soil volume–to hold enough moisture so the plant won't die if you fail to water it 3 times a day. Plants that dry out get stressed, and plants that get stressed have lower yields, pick up diseases, and attract pests. Although it's more expensive buying larger pots and filling them with potting soil, it saves a lot of work–and disappointment–later in the season. Grow bush (determinate) tomatoes in 5-gallon (27 cm) pots, and larger vining (indeterminate) tomatoes in 7-gallon (35 cm) or larger pots. 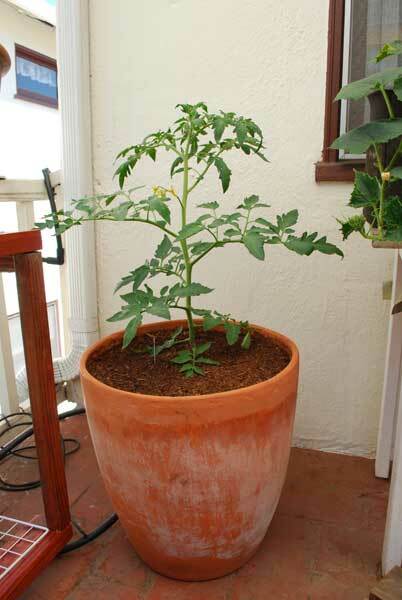 A 10-gallon (45-50 cm) container is ideal for growing indeterminate tomatoes. 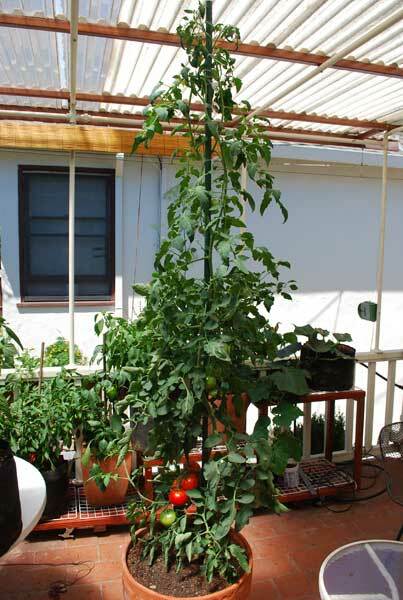 When you're growing tomatoes in containers, the size of the pot is more important than the material. 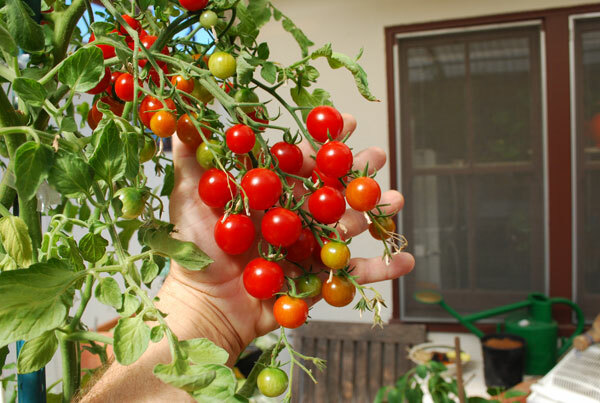 As long as there's enough soil volume, tomatoes grow well in terra-cotta pots, glazed ceramic pots, deep wooden boxes, or plastic pots, but pot material and color can make a difference, mainly by influencing temperature. 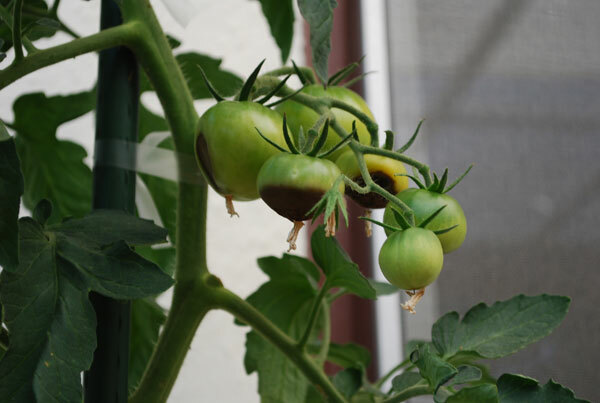 Light colors reflect light, and dark colors absorb it, so if your container tomatoes are in a hot place, choose lighter materials, and if you live in a northern, alpine, or cool-summer area, choose darker colors. See container garden temperature for more information on moderating container garden temperatures. Heavier materials, like terra-cotta and glazed ceramic, hold heat, while lighter materials, like wood or plastic, release it more quickly. 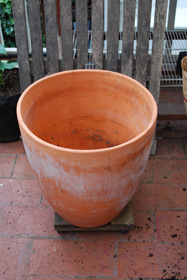 Where weight is a consideration, choose large wood or plastic pots for growing tomatoes in containers. (See Containers for Container Gardening for more on the pros and cons of various container choices). 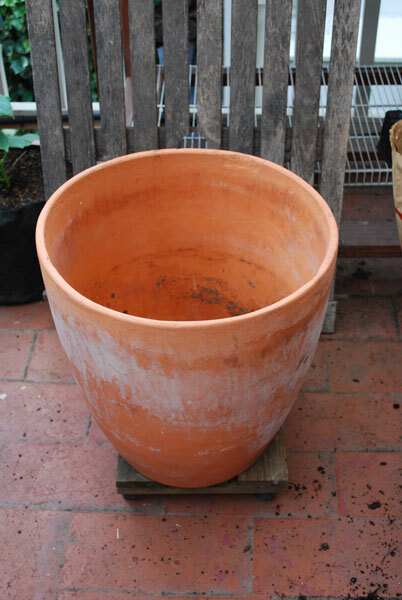 Fabric Smart Pots are also a good light-weight alternative to heavier terra-cotta or glazed ceramic pots. It’s a good idea to place the pot on a rolling plant dolly before you plant, so it’s easier to move around if you need to. If you're using tall stakes and have a roof on your deck, insert the stake into the pot before planting. I learned this the hard way last year, when I planted a 'Carmello' tomato in a tall, 15-gallon terra-cotta pot. When I tried to put a 7-foot stake in the pot a couple weeks later, the stake kept hitting the deck roof, so I had to wrestle the pot off the plant dolly and tilt it over to insert the stake, spilling soil all over in the process. As a general rule, cherry and the smaller salad tomatoes are easier to grow in pots, and more prolific, than large beefsteak varieties. Beefsteak tomatoes aren't hard to grow in pots if you get the soil right and water frequently, but they suffer more if you don't get these details right. Determinate (Bush) tomato plants are smaller, more compact, and easier to grow in pots, but they set fruit all at once, and then they're done. 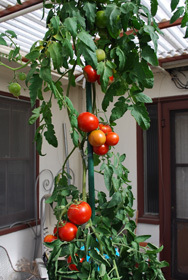 Indeterminate (Vining) tomatoes produce more fruit, over a longer season, than their stouter cousins, but they grow much larger, need staking or support, and need to be pruned and tied once or twice a week. There are also dozens of varieties of indeterminate tomatoes, giving you a much wider flavor pallette than that available from the more limited number of determinate tomato varieties. 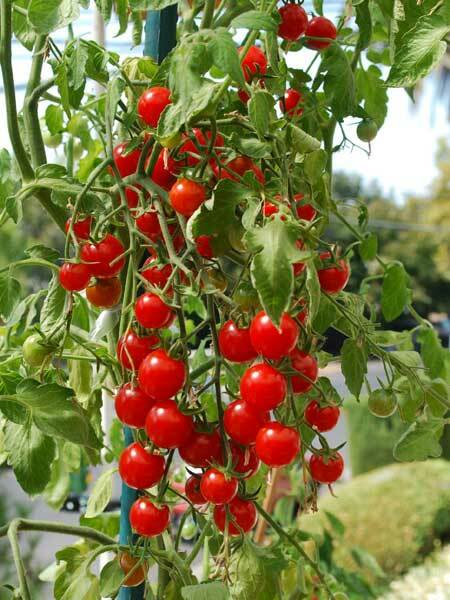 Recommended Determinate Tomatoes: 'Patio', 'Celebrity', 'Gil's All-Purpose', 'Oregon Spring'. Recommended Indeterminate Tomatoes: 'Carmello', 'Carmelita', 'Stupice', 'Early Girl', 'Jewel Enchantment', 'Matina', 'Green Zebra' (Salad Tomatoes). 'Sweet 100', 'Sungold', and 'Black Cherry' are good cherry varieties for growing tomatoes in containers. For descriptions and ordering links for these and other tomatoes, see my Tomato Varieties page. One big advantage of organic container gardening is that you can build a whole season's fertilizer into the potting soil when you plant. This link shows how to build organic fertilizers into the potting soil for a 7-gallon pot. If you're using a 10-gallon or 15-gallon pot, increase the amounts by 25-30%. By combining quick-releasing and slow-releasing organic fertilizers, and tweaking the ecosystem of the pot, you create a self-sustaining engine of growth...just add water. Every day. I have a lot of clients, so I buy organic soil amendments in bulk, and mix my own blends according to what I'm planting. This is impractical for most people, but fortunately, you can buy potting mixes inoculated with mycorrhizae, and use a good, balanced organic fertilizer like Dr. Earth Organic Tomato, Vegetable, and Herb Fertilizer . This 'Carmello' tomato was grown with two cups of Dr. Earth Tomato, Vegetable, and Herb Fertilizer and 1/2 cup of dried, crushed eggshells mixed into the potting soil at planting time. It also got 1 quart of live worm castings mixed in at planting, and 1 shot of "worm tea" a month after planting. You can track the growth in the photo gallery below. Container tomatoes are subject to many of the same pests present in field-grown tomatoes: The infamous tomato hornworm, as well as aphids, whiteflies, and other tomato pests. Because they're grown in potting soil and often isolated from other gardens, they're less susceptible to diseases, but many tomato diseases result from airborn spores. When you're growing tomatoes in containers, be aware that container-grown tomatoes are more susceptible to Blossom End Rot (BER) than tomatoes grown in the ground. BER is not a disease, it's a physiological disorder that causes sunken, brown spots on the bottom of the fruit. Blossom End Rot is caused by uneven water transport in plants. The most common cause is uneven watering. Container vegetables are much more likely to dry out, and dry out more frequently, than the same vegetables grown in the ground. BER was once thought to be caused by calcium deficiency, but research has shown that it's due to an inability to transport calcium to the fruit, and not a deficiency of calcium. Still, if you're concerned about adequate calcium, incorporate ground oyster shell or crushed, dried eggshells into the potting soil when you plant. If you're worried about Blossom End Rot, plant cherry tomatoes instead of the larger salad or beefsteak tomato varieties. I've never seen BER on cherry tomatoes.